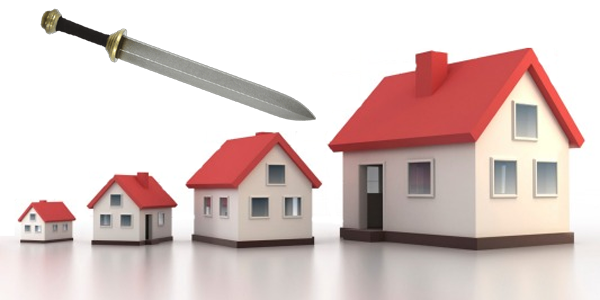 Some borrowers are living with a sword hanging over their heads: a mortgage they have little or no hope of repaying. One possible answer is the “lifetime mortgage” – but it’s hardly ideal. What is an interest-only mortgage? It’s one where only the interest is paid off each month, so the full amount must be repaid as a lump sum at the end of the mortgage term. Many individuals who are currently in their 50 and 60s may have used interest-only mortgages to buy their properties, taking out an investment (an ‘endowment’) at the same time. The idea was that the endowment would grow over the years and pay off the lump sum, with (hopefully) some extra left over. The reality has proved rather different, since investments have not delivered as predicted all those years ago. The result is that many holders of endowment mortgages may face a substantial bill when their mortgage term expires. In an even worse predicament are those who simply took out interest-only mortgages with no endowment, who face the prospect of having to repay the entire lump sum. According to the FCA, up to 1.3 million borrowers have ‘little or no hope’ of repaying their debt. Faced with this predicament, one solution in particular has proved popular. A lifetime mortgage is a type of equity release, which can release money from the equity on the home to repay the original mortgage. The lifetime mortgage is then paid off from the proceeds of the home when it is sold – but it means you can continue to live there. Will you be able to continue to afford the interest payments on the debt once you retire? Interest rates are historically low, but they could well rise again. If it is the lender who deals with the sale of the property, and its primary aim is to obtain repayment of the outstanding loan, does it have the necessary incentive to ensure that it obtains the best sale price for the property and therefore maximises the residual lump sum for the borrower’s heirs? One alternative solution to this problem might be for the borrower to downsize at retirement, purchasing a cheaper home and so releasing equity which could be used to repay the loan. However, who would want to be forced into considering this as an option? This dilemma hasn’t arisen overnight. It has long been known that holders of investment-backed mortgages run the risk of a shortfall when their repayment dates arise. Insurance companies have been writing to their endowment policyholders on an annual basis to remind them of this for years. It is undoubtedly true that many of these endowment-linked mortgages were mis-sold in the past, and in thousands of cases policyholders have been compensated for their consequential losses. Nevertheless, borrowers have generally had time (and still have time) to plan to meet the shortfall when repayment is due. Yet one of the most frightening statistics is that one in ten borrowers has no plans in place to repay their mortgage. In other words, one in ten borrowers is merely hoping that something will turn up. All in all, a pretty stressful way to live. Thankfully, it doesn’t have to be like that. A financial plan will help to show you what your financial future might look like, based on various assumptions. Once you’ve drawn up a plan, any red flag issues – such as repaying your mortgage – will immediately become apparent. You can then look at the various options available so you can plan to deal with such issues now – rather than kicking the can down the road and hoping for the best. Some of your available options might not seem very exciting; often it can boil down to saving more, spending less, earning more, working for longer and/or downsizing at some point. The point is, you gain a clear idea of what action needs to be taken, to what extent, and why. Without this knowledge, it’s too easy to ‘freeze up’ and take no action at all, because you simply don’t know what might help. With a plan, you can take positive steps and put the necessary remedies in place while there is still time to do so. A home should be a home, not a source of stress hanging over your head. Independent Financial Advice can show you which way to turn, and enable you to take back control of your future – and your family’s inheritance too.